Storage and peripheral vendor LaCie has always been known for its Mac-friendly products, but now the company is going head to head with Apples Time Capsule backup offering with the new LaCie Wireless Space, which combines Wi-Fi connectivity with all the flexibility of a NAS storage device…including backup services. The LaCie Wireless Space includes a 802.11b/g/n wireless networking as well as gigabit Ethernet, so the device can pop onto a home network and act as a wireless router or access point. 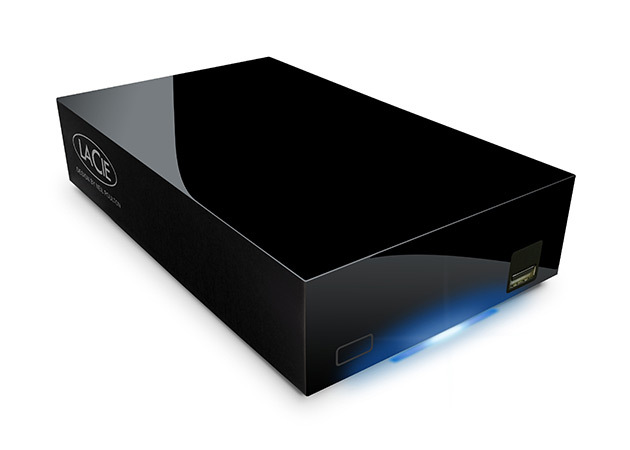 The Wireless Space also packs 1 or 2 TB of storage, so the Wireless Space can work as network-attached storage either via Wi-Fi or wired Ethernet—and the does one better than Apple’s Time Capsule Wireless Space packs the DLNA, iTunes, UPnP, and media-streaming prowess of LaCie’s NAS solutions so users can share media with any computer on their home network, or to other DNLA/UPnP devices like televisions and game consoles. And, for folks looking for a simple backup solution, the Wireless Space ships with Genie Timeline Software for scheduled backups on Windows systems, and is compatible with Apple’s Time Machine backup software built into Mac OS X 10.5 and newer. The Wireless Space also features a case design by Neil Poulton, which is becoming standard for LaCie’s storage products. The Apple Time Capsule still has an edge for offering dual-band 802.11n Wi-Fi, but the DLNA and UPnP make the Wireless Space useful for a whole different range of customers. The LaCie Wireless Space is available now, with the 1 TB version going for $229.99, and the 2TB version carrying a $349.99 price tag.